You can resize object(s) by dragging the selection border. 1. 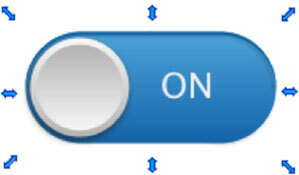 Select an object you want to resize – you will see the blue arrows selection border. 2. Drag the arrows to change the size of the object. If you drag using the arrows at the corners, the object will retain its aspect ratio. If you use the arrows on the sides, the object will change its horizontal / vertical size only.